Frontogenesis in the meso-a and meso-ß scales in the Mediterranean basin: From cloud arch to cloud cells. 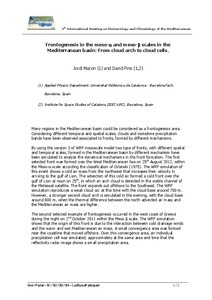 Mazon, J.; Pino, D. Frontogenesis in the meso-a and meso-ß scales in the Mediterranean basin: From cloud arch to cloud cells.. A: International Meeting on Meteorology and Climatology of the Mediterranean. "IMMCM 2013: book of abstracts". Banyuls, Roussillon: 2013.